It’s happening, it’s really happening: Jeon Ji-hyun is re-teaming with her You From Another Star writer, Park Ji-eun, for a new drama co-starring Lee Min-ho (Heirs), with a high likelihood of him reuniting with his City Hunter director, PD Jin Hyuk. Is China even going to be able to handle the excitement? I half expect the country to sell out of every single thing featured in the drama within its first week. In fact, reports state that this project is already attracting the highest-ever sum for a Hallyu drama licensed in China, having received an initial offer for licensing rights from a Chinese distributor at $50,000 USD per episode. This is nearly double the current top amount, which was Descended From the Sun at $27,000 USD per episode. That’s pretty remarkable, given that nothing’s been filmed yet, or divulged beyond the barest details. Although, considering that the popularity of their projects did lead to the production of an honest-to-goodness Chinese drama named Heirs From Another Star, it probably shouldn’t be surprising. The casting of the actors had been previously reported as possibilities, but now we have a confirmation for Jeon, Lee, and writer Park, while PD Jin is named as a probable director. We did know he was talking to writer Park about working together, and the project has been picked up by SBS (where PD Jin is contracted), so I’m fairly confident that we can expect him to confirm. We also have a (working) title for the project and a basic premise: It will be titled Legend of the Blue Sea, and it’s based on the story of the Little Mermaid—the Hans Christian Andersen version, that is, not the sunnier Disney interpretation. That doesn’t mean it’ll necessarily be a sad story (I expect the opposite, in fact); Koreans and Korean dramas just have a penchant for the story of the sad mermaid who loved a prince unrequitedly, and disappeared into bubbles when she couldn’t bring herself to kill him to win back her own life. K-dramas are a sucker for the angsty romances, but I’m pretty sure we can count on a happy ending. Lest there be rioting. Legend of the Blue Sea is planning for a 20-episode run on SBS in October. Nooooooooooooooooooo. Not the sad Little Mermaid, please. Writer.,story and Jeon Ji Hyun sound awesome...but..Lee Min Ho..?? crap crap crap crap....It should be Won Bin or Kang Dong Won..
Lee Min Ho is an excellent actor and wonderful next to your proposal (which I do not know as an actor ) . So I'm sorry, but your "crap crap crap ... " doesn't convince people that your proposals are better than Lee Min Ho. And Lee Min Ho i like youuuuuuu !! OH MY GOD YES. Lee Min-mermaid would be amazing. Though my girlfriend is a gu-miho gives me warm memories of the story.. Just use it right.. This is the theme song of the drama. Lee Min-ho will sing it, poised on a rock, to the tune of "Part of Your World". Look at this chest, isn't it neat? Wouldn't you think my abs collection's complete? How many wonders can one abdomen hold? You wanna see my manboobs? There NEEDS to be a shower scene everytime this music plays in the background! I can't " unsee " Lee Min Ho singing it now. He might even be more suited than Ariel? I NEED TO SEE THAT, YY. Count me in that prayer circle! I do not know who you are. But we need to become best friends. Like... NOW! I vote this for #1 entry in next week's Beans of Wisdom! I love this comment! mad my day rofl! I definitely started to sing in my, ahem, closest rendition of Ariel's voice. LOL. The last stanza has got to be the best... I'm smitten on the "abzmos". YY, can you, like, write out the song please???? Where can I download this hit song ? I shall make it my ringtone ! "How many wonders can one abdomen hold?" The story of YY's journey to paradise and her true love. One man of many packs, one woman of deep passions - their fate is sealed when she spots him showering under a waterfall in Nepal. (Why not?) Avalanches and altitude sickness cannot diminish their growing feelings. Will they reach the pinnacle of their love in Heaven on Earth? Go on and kiss the abs. You are all creative people! Oh my... Can't take that song off my head now. I always love LMH, SIG and SSH article in DB. The comments are always fun, witty, and hilarious, and often times veered to R rated. Roflmao...you guys are absolutely crazy but hey, this is way way better than comment wars. OMG. That was the best thing I've scene on the Internet in my whole life. You win for eternity! ROFL. I love you guys! Your comments always make my day. Pwahaha! i actually sang it as I read. Lol~! I volunteer to sing this OST!!! So much brilliance in this. He he he ...... very funny Thank you! OMG THIS IS... AHAHAHAHAH FREAKIN HELL U R A GENIUS!! Can I post this online elsewhere? Oh my...most definately must be. Think of all those shirtless scenes our merman has to film. Ok but every time you think of Surplus Princess and want to be sad remember this: the leads fell in love in real life and are publicly dating. In fact in the blooper reel for Beautiful Miss Kong Shim this weekend they mentioned OJW's girlfriend (who is currently in Monster as the bratty chaebol princess). Jokes aside, JJH really is coming back to the small screen already?! On top of that most likely doing another live shoot drama?! Wow. Comment wars = more comments to moderate = less time watching Song Jae-rim err... working. Let there be drama peace ? Where: It's all about the drama. Where: It's about loving what you love. Where: Its great to be e a troll but not cool to be a troglodyte. Commenters enter at their own risk and spectators bring their own popcorn. Why? I can't believe they got the 2 of them to agree to it in the first place? Or are the comments about the age difference again? The $$ is in the Chinese market and there's nothing like continuing to get lucrative Chinese CF contracts than starring in another huge hit TV series. Now I get that. Lol. The comments war is scary. I've just seen the darkest part/side on DB. The links at the bottom of this news. They are selling episodes to China so will be preproduce. You have to submit the entire drama in full to the Chinese broadcasting agency for them to pass before it can be streamed or aired. No! Please let there be no bloody comment wars. I can't stand everyone of us fighting. Peace must reign not war..
No way this will be live shoot. Pre-produced for simultaneous airing in China is my bet. But don't they usually announce it beforehand if they're going for a complete pre-production and simultaneous airing in other countries? Shooting probably won't start for another month or two and 20 episodes take at least 5 months to shoot and if SBS plans the broadcast for the last quarter of the year, it won't be aired in China until next year since it needs to be approved by the Chinese authorities first which also takes a while. Wow ! What a casting coup. I wonder if it'll be pre-produced ? The casting is good, but I won't be so sure about a happy ending if it's based on H.C. Anderson version, otherwise what is the point of basing it on that version. Then again if it's not pre-produced the temptation to change it will be high. Personally I prefer more original ideas but will definitely give it a try. They might give it the original ending and then have a last-minute save for the mermaid. Korea loves tragedy, but even their most tragic dramas tend to have a happy or at least bittersweet ending rather than a depressing one. yeah. It should not take the same road with GG-14 Days as well. What a terrible way to end the drama! I had no idea there was such a "parody drama". O_O Almost sounds like an SEO ploy! But anyway. I'll watch anything Jeon Ji-Hyun and the pairing sounds awesome. For LMH's sake, I really hope the storyline works out! Ooooh, I'm getting excited for this in spite of myself. The whole team is just so. much. win. I'm curious though, is it that you don't like "noona love" within the story or that you don't like older women acting as the romantic partner of younger men? Because in My Love From the Stars, Jeon's character is actually a lot younger than Kim's, so if your issue is the former, you might wanna give it another shot. Actually both, but only if the age difference between actors is noticeable, which in my opinion was the case of My Love from the Stars, while Ku Hye-sun didn't look older than Lee Min-ho in Boys Over Flowers. Generally I prefer characters who fall in love with someone their age. Oh, I see. Yeah, I think I'd prefer same-aged couples too, but I'd have to stop watching so many things if I adopted that as a principle. wait....Ha Ji Won and Kim So Hyun, you mean the handsome and ever poplular Kim So Hyun? I never heard about this, this is news to me. I'm hoping Jeon Ji-hyun's character will be a single mother so she can cart her new baby around the set! Wow this is going to be big. Hopefully it'll be entertaining. Kim Eunsook's drama with Gong Yoo and Kim Goeun will also air in November. Wow this is Park Jieun vs Kim Eunsook. They probably won't be televised at the same time slot. CJ E&M bought Kim Eun-sook's production company and acquired shares in Park Ji-eun's agency in January this year. I doubt CJ E&M wants their writers competing against each other. Ah yes. I mean both will be in November. Definitely not same time slot, Wed-Thu for this one and possibly Fri-Sat on tvn for KES drama. Kinda funny that they will both write fantasy drama, Goblin from KES and Little Mermaid from Park Ji Eun. Hope the people behind the show will pay attention to the story, and not rest everything on the star power (and PPL). I love when LMH is paired with actress his senior. He looked more into the character in my pov. Oh, PMY included, although they're only 1 year difference. Why does it even need to be based on the Little Mermaid?! Compelling as the fairytale has always been to me, I don't need a drama reenactment of it, set in modern times, much less in Korean, nor with this cast. And can they honestly do mermaid without JJH (or any other actress/actor) looking ridiculous in the tail-get-up?? I don't get it. Okay.. just by reading the main cast & writer names, we will surely have another MEGA HIT across the Asia after Man From The Stars & Descendants of The Sun in October. Now this is the news of the year. Can't wait till October! PD Jinhyuk also confirmed. It's in the official news. this is gonna be exciting! ! .... remembering MLFAS - where is KSH ? Any hope for another drama before he is off to the army ????? Any news ppl ?? I'm pretty sure that he will squeeze in another drama before army. he tends to work a lot. What about Ji-sung and Hwang Jung-eum? They first act together in Secret, and then in Kill Me, Heal Me. This kind of pairing are very rare though. It's funny that these couples have the same surnames. I'm helpless when it comes to mermaid stories and I personally love Park Jieun. Bring it on! I can't wait for this to come around. But October seems unrealistic maybe December or January since they will use the pre-filmed airing model rather then live-filming. lol ... you should totally watch this show then .. His fan club will be present in full strength ... the comment wars will be epic ! ..... on a separate note - i liked, no loved him in city hunter ... but everything else before/after it was just bleh! for me ..
but i adore JJH. so fingers crossed. I probably will because I love her, but for me he is really aggressively mediocre. His acting in City Hunter was the same for me as his acting in everything else he has been in. It doesn't help that I thought City Hunter was ridiculous. I don't think he was cast because he is the greatest actor in South Korea. We all know why he was cast. So from that point of view, he was the perfect choice for this. Personally, I liked him in "Faith", too. JJH is one-dimensional as well. Everyone has their fans, and that's a good thing. That is certainly my impression of her too - kind of 1 note. But she does sassy the best. OMG it seems a miracle that I found someone who doesn't like Lee Min Ho. Definitely the most over rated actor ever. I simply hate most of his dramas including BOF and Heirs. A horrible actor whose only expression is to be annoyed or smirking. JJH on the other hand is a favourite. She will totally own the show. Honestly, though, I'm here with you. I don't think Lee Minho is all that good. I love Jeon Ji-Hyun, so I'll probably watch this for her. I hope LMH does not let me down because I need this to be worth the watch. The plot sounds weird, but I said the same thing about MLFTS and I think that's my favorite K-drama. I love it to pieces. "Sometimes in that order or he switches it up"
hundred years pass, she slowly reborn into a different person, live in the different world, forgot what she once was, her realm change. One day upon discovering the world above the sea, she found someone who shines brightly that reminds her of her past. She wants to become human again! What an epic story!!! Then Kim So Hyun will do a cameo in the drama as JJH's first love. Heol. If the storyline is good, I'll probably watch this coz of JJH. Not a fan nor a hater (Just plain disinterest) of LMH so I hope the chemistry will be daebak for the drama's sake. Well if Suzy could show up in MLFTS then Kim Soo Hyun should definitely be able to cameo in this drama. The ratings would go through the roof. Well, this will certainly be fun! I actually look forward to seeing this writer's spin on this particular fairytale, considering how much k-dramas love to feature it. I still remember how much I loved episode 7 of MGIAG and its ending! Ah, so cheesy, but so beautiful and uplifting. This pairing should be great together That said, for some reason, I'm not feeling anything special for them yet. I think it will depend on what kind of characters they're playing. This is a guaranteed hit,Lee and Jun are kinda more famous than Song joong ki and Kyo and they also have a star writer,Their odds are a little bigger and considering how huge DOTS became this one can become even bigger. Also SBS have secured their 2013 hitmakers(IHYV,Masters sun,heirs and MLFAS) they have Gong hyon jin,Lee min ho and jun ji hyun,if only they could get Lee Jong suk or Bo young....maybe get Kim soo hyun in a follow up drama.! Wow! I have high expectations for this drama! Finally! I have been on the verge of vegetating this year (not being able to watch any other drama except DotS and Dear my Friends)! Jeon Ji Hyun is great! It's nice to see that South Korea is trying to bring back the Hallyu Wave! Now that I think about it, it seems that all those annoying dramas (Oh Hae Young Again, Lucky Romance etc. and most of the blah-blah-2015 dramas - except for Producers and Mask) are meant to keep the viewers busy while some high-quality ones are being pre-produced. Lovely! WOW. so OH HAE YOUNG just annoying dramas? what a double standard you are. I dont think this drama is high quality like you said,it becomes the "quality drama" (based on your interpretation) because it will have the A-listed actress Jeon Ji Hyun. WIthout her or any A-listed actress, this drama wont' achieve the high-quality one like you said. Well, not exactly. I seems to be a high-quality drama not because Jeon Ji Hyun is in it, but because Jeon Ji Hyun chose to act in it. She is rather selective and she has always chosen good projects (be it a drama or a movie). No offence, but Eric doesn't know what projects to pick (or maybe he is not offered high-quality ones). He has always chosen infantile dramas meant for some teenage fangirls. Well, it is after all a way to aquire some ratings without much effort. welp, that's one way to get money. Anyway, it's a done deal.... I'm peacing out. The little mermaid is one of the saddest yet one of the most fascinating fairy tale I've read in my life. I didn't see the Disney version first, my dad gave me a nice illustrated Hans Christian Anderson of fairy tales book. This one is close to my heart. They better not screw it up with lazy writing and too much cliches. I cried buckets over the book so I expect to do the same here. IS THIS FOR REAL? SERIOUSLY? This has to be a joke, right? Now I'm curious. Is it more You From Another Star, or Heirs? I'm only willing to watch if it's the former. Gotta love that title, though... "My Love from Another Meow" would be neat, too! Oh what I'd give to have Song Manse as the Mermaid. ;) Just kidding. SO EXCITED for Jun Jihyun!! I like her when she's playing sassy characters because she really just gets into it. I wonder what her character in this drama will be like. Aaaa my cutie pie Manse! ?? LMH was one of the first actors I took note of when I started watching kdramas. He peaked in City Hunter and it's been downhill ever since. I will watch this to see if I can write him off mentally or he might prove me wrong. I don't need to be reminded by his fans about his gazillion social media followers because I am just trying to form a sort of last opinion on him. Heirs was so bad that I wonder if I can ever 'unsee' Kim Tan in LMH. Since we have a good writer and good PD for this and not to mention one of the top K actress, there is simply no excuse for LMH not to deliver. Heirs was awful, but I liked his character in "Faith". Has the planets aligned? 2 giants in one drama together? China is gonna have a major meltdown. I have been waiting for you LMH.. Happy to see you finally come and commit to a drama. I honestly feared the worst which is him never coming back to dramaland. It seems like he enjoys doing movies more these days. is Jeon ji hyun will be a mermaid??? SEROUSLY??? A MERMAID??? Wuttttt??? LMH as the mermaid is the only way I'd be lured to watch this. LMH does nothing for me but if he were to be the mermaid/merman then I'd definitely tune in! I can see him taking notes from Zoolander. "I just thank the Lord (your mother) she didn't live to see her son as a mermaid." Wow, this sounds amazing - I am so in! What I would REALLY like to see, though: Let the male lead be the pining mermaid for once, and the lady be the princess! Any chance of that, drama gods? Please say yes! And of course there must be a happy ending. No dissolving into bubbles or flying off to a distant marine planet. One very quick question: some websites are reporting that the drama is being sold for 600k/episode with initial offer starting at 500k/episode, whereas it's 50k/episode here... Which one is correct? It's 500k. Makes no sense if it's 50k really. That won't even come close to covering the per episode expenses of getting JJH to star. Is it 50,000 or 500,000 ? Seems like the second option because 50,000 would make no sense in China. Descendants of the Sun currently holds the record for the highest selling price at $270,000. 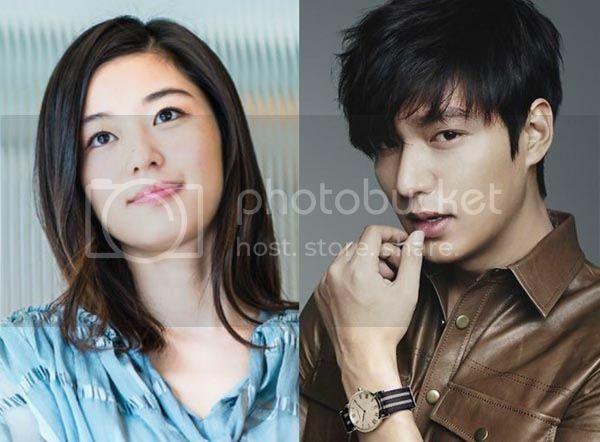 Jeon ji hyun will eat lee min ho alive in acting if it's comedic. If it's a melo, can't really say. I don't think so. If there's anything LMH can do, it's comedy. Please don't make it a melo, he can't emote. Have you seen him in Heirs? His crying scenes were so cringeworthy and every time he's sad or hurt, he either looks dazed or constipated. He's much better when he's playing lighthearted roles with a bit of debonair. He can't do comedy well. Jun will eat him alive because she does comedy well in melo, they are at par with each other - mediocre. COUNT ME IN DRAMA, COUNT ME IN!